Blink & Miss It - Alicia Coppola has a small speaking role in the first episode of Star Trek Voyager. 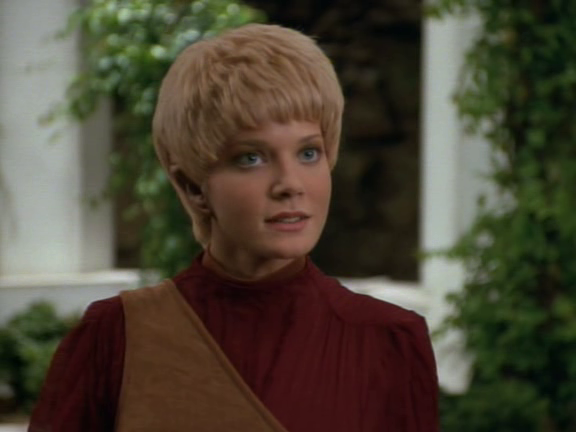 I first noticed her when she played a murderer on CSI: Crime Scene Investigation so when I re-watched Star Trek Voyager, I noticed her straightaway. Even so, I missed quite a bit of the series and only saw parts of the series and never in its entirety. It was only in the early 2000s when I was studying in Australia that I rediscovered my interest in the series when I stumbled upon the Star Trek Voyager series on DVD! We didn't have Blu Ray theAll 7 seasons! We didn't have Blu Ray then. But it was still pretty pricey. But I never regretted spending money on the DVDs because I fell in love with the series and its characters. When I watched the final episode, I was pretty bummed and wish there was more to watch. Strangely, I never got hooked on the other series under the Star Trek franchise like Star Trek: The Original Series, Star Trek: The Next Generation, Star Trek: Deep Space Nine, or Star Trek: Enterprise. I haven't tried watching them again but maybe one day I will. The reason why I decided to pull out my Star Trek Voyager DVDs and take them out of storage to watch is because of the soon to be released Star Trek film Star Trek Into Darkness, a follow-up to the first J.J. Abrams' film in 2009 Star Trek. I thought, why not re-watch the series that got me sucked into the world Gene Roddenberry created before the film is released. That would be a great way to remember all the reasons I fell in love with the ethos of Star Trek. So here I am. Sitting back in the chair of my home "office", feet propped up on my bed, cold coffee beside me, on an enjoyable Monday afternoon, about to embark on a journey back into the Delta quadrant with Captain Janeway and her Voyager crew. It took 2 1-hour episodes just to set up the premise of the show. While the 2 episodes may be a little slow moving, I'm still glad they did it because it really allowed the audience to get to know the various players in the series better. And since Star Trek Voyager has a large ensemble cast, it had A LOT to do! "Toto, I've a feeling we're not in Kanas anymore." Paris: Only when they're in visual range. Lieutenant Stadi: That's our ship. 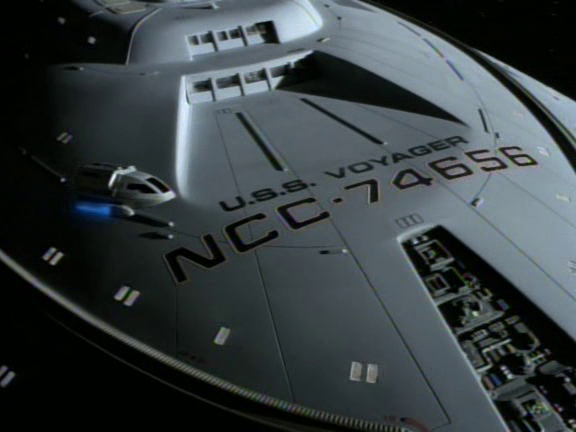 That's Voyager. Intrepid-class. Sustainable cruise velocity of warp factor 9.975. 15 decks. Crew compliment of 141. Bio-neural circuitry. 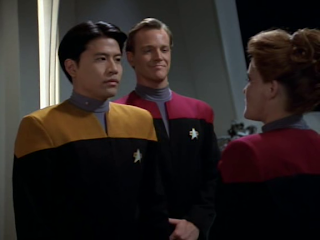 Captain Janeway: Mr Kim, at ease before you sprain something. Ensign, despite Starfleet protocol, I don't like to be addressed as Sir. Harry Kim: I'm sorry... Ma'am. Captain Janeway: Ma'am is acceptable in a crunch but I prefer Captain. We're getting ready to leave let me show you to the bridge. Tom Paris: There you see. I told you it wouldn't take long. Tom Paris: Was the accident my fault? Yes. Pilot Error. But it took me awhile to admit it. Urgh! 14 varieties and they can't even get plain tomato soup right. Tom Paris: What's the difference? I lied. Tom Paris: I'll tell you the truth Harry. All I had to do was to keep my mouth shut and I was home free. But I couldn't. The ghosts of those three dead officers came to me in the middle of the night and taught me the true meaning of Christmas. So I confessed. Pft. Worst mistake I ever made, but not my last. After they cashiered me out of Starfleet I went out looking for a fight and found the Marquis. And on my first assignment I was caught. Tom Paris: Frankly I think it was tougher on my father than it was on me. Look, I know those guys told you to stay away from me and you know what, you ought to listen to them. I'm not exactly a good luck charm. Harry Kim: I don't need anyone to choose my friends for me. Captain Janeway: Kim's mother called me just after he left earth. Delightful woman. He's her only son. He left his clarinet behind. She wanted to know if she had time to send it. I had to tell her no. Did you know he played the clarinet in the Juilliard Youth Symphony? Captain Janeway: I barely knew him. I never assumed to have the chance to get to know any of them. I have to urm... I have to take more time to do that. It's a fine crew. And I've got to get them home. Captain Janeway: You're right as usual. I have missed your counsel Tuvok. Captain Janeway: Well... But worried about you. Captain Janeway: I'll get you back to them. That's a promise Tuvok. 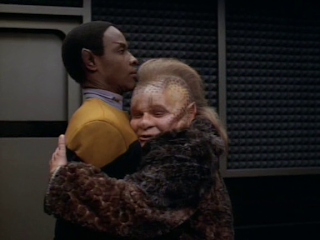 Another very fascinating relationship that exists in Star Trek Voyager is between 2 very opposite characters - Tuvok and Neelix. Not everyone has the affinity to become good friends. And it's really fascinating to see Tuvok and Neelix try to find a way to co-exist amicable. This relationship's roots form in this 2 episode pilot and already even without knowing what comes next, we can foresee a lot of issues between these two. Captain Janeway: We'd appreciate any help you could give us in finding these Ocampa. Neelix: I, I, I really wish that I could help you. I do. But as you can see there's just, there's so much debris for me to investigate today. You'd be surprised the things of value some people abandon. Captain Janeway: Of course we'd want to compensate you for your trouble. Neelix: Unless of course you had... water? Captain Janeway: Good. We're beam you over and tow your ship into our shuttle bay. Mr Tuvok, go to transporter room 2 and meet our guest. 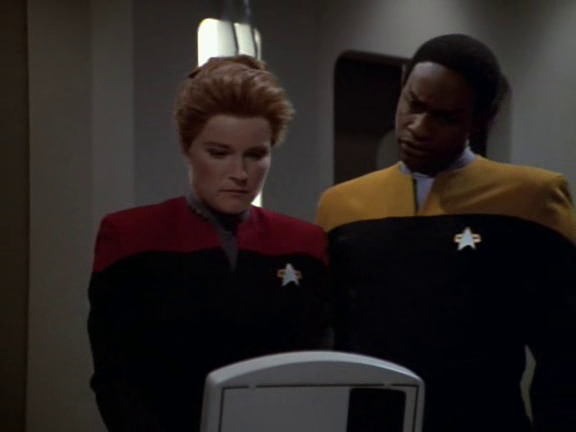 Captain Janeway: We have a technology which can take you instantly from your ship to ours. It's quite harmless. May we? Oh and I love the way Harry talks back to B'Elanna. It really changes our perception of his 'pushover' status from when he encountered the Ferengi. 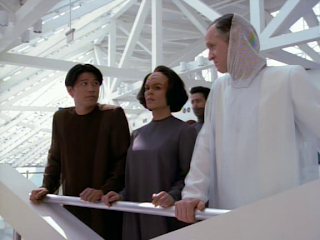 It also sets up a friendship between B'Elanna and Harry that promises much playful jabs and name calling. Mostly by B'Elanna calling Harry 'Starfleet'. B'Elanna meets Harry 'Starfleet' Kim for the first time. Harry Kim: It's okay. It's okay. B'Elanna Torres: Who are you? Harry Kim: My name is Kim. Harry Kim. I'm an Ensign on the starship Voyager. I was kidnapped from the array just like you were. I don't know where we are. B'Elanna Torres: What was Starfleet doing at that array? 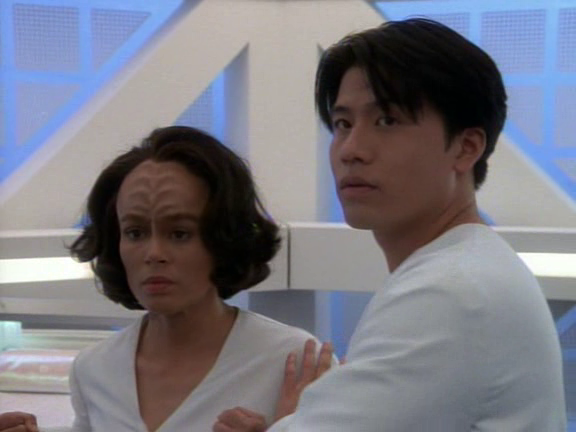 B'Elanna Torres: You mean you were trying to capture us! 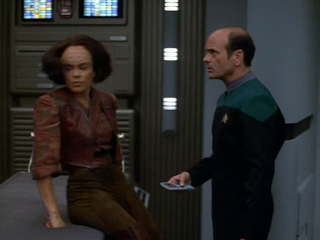 B'Elanna Torres: I don't find this at all amusing Starfleet. Harry Kim: There's no point. It's locked. Hey! Hey hey hey what's that going to accomplish? B'Elanna Torres: What are they doing to us? What are these things growing on us? B'Elanna Torres: You're right Starfleet. It's the Klingon half of me. It's just hard to control sometimes. Harry Kim: What's your name Marquis? B'Elanna Torres: B'Elanna. B'Elanna Torres. In the pilot episodes, besides setting the scene and introducing characters, the show also takes the opportunity to address an environmental concern that was very big then and even now - Global warming and the importance of water conservation. Maybe I was thinking too much about what its trying to say, but still, if it was done on purpose then props to the scriptwriters to be able to fit in a moral story on top of introducing characters and setting the premise of the show. I mean, there might not be a water source running under the surface in every continent that can sustain our entire civilization for 500 generations! Ocampan: Our society is subterranean. We've lived here for over 500 generations. B'Elanna Torres: But before that you lived on the surface? Neelix: Ah! Mr Vulcan. Come in. Come in. Please. I can hardly see you. I wanna thank you for your hospitality. I must admit I haven't had access to a food rebel, er er er, replicator before. Tuvok: I'd never have guessed. 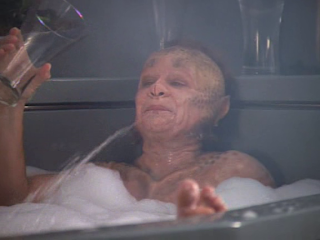 Neelix: And to immerse myself in water. Oh do you know what joy this is? No one around here wastes water in this manner. Good sand scrub. That's the best that we can hope for. Chakotay before he becomes Captain Janeway's First Offier. Kes: That's right. They don't understand. They have no way of knowing that the Ocampa have been dependent on the caretaker for so long that we can't even think for ourselves anymore. They don't understand that we were once a people who had full command of our mind's abilities. Toskit: We should not dwell on what's been lost but on all that's been gained. Kes: We've gained a talent for dependance. For simply taking what we've given. I'm going to help them Toskit whether you like it or not. And I think my friends will join me. Harry: I don't know Doc. It's my first mission. Doc: Doesn't anyone know how to turn off the program when they leave? The Doctor is also a source of much comedy that you will see in future episodes. And while you don't really know much about him yet, you already know the basics in this first 2 episodes. I think part of the draw of Star Trek is the idea of exploration and the adventure of finding new worlds and meeting new cultures. That's why the travel industry is so huge isn't it? We all have this innate desire to explore and to discover new things. And I like that these first 2 episodes refresh our memory as to the core goal of the Federation. Along with the Prime Directive and the fact that evolution and technological advancement is as exciting as it is to explore space. Captain Janeway: Children have to grow up. We're explorers too. Most of the species we've encountered have overcome all kinds of adversity without a caretaker. It's the challenge of surviving on their own that helps them to evolve. Maybe your children will do better than you think. What works with Star Trek Voyager is that the series is given the opportunity to explore a new side of the galaxy. This means that it is able to encounter new species and the fact that they don't have an army to rely on means the stakes are higher for them to use all means necessary to find a way home. But does that mean they should compromise on their beliefs and what the Federation stands for. 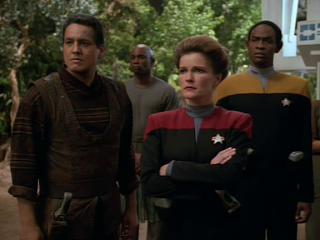 Captain Janeway: And what happens to the Ocampa? After we're gone. Just like Dorothy, the Voyager crew just want to find a way home. But it's journey home that is where all the excitement is isn't it? It's not just about how to get home, but what you had to do in order to do so. B'Elanna: What do you think you're doing? That array is the only way we have to get back home. 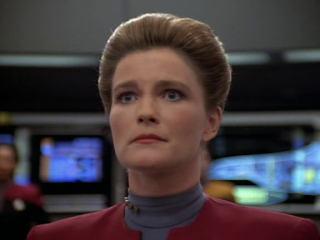 Captain Janeway: I'm aware everyone has families and loved ones at home they want to get back to. So do I. But I'm not willing to trade the lives of the Ocampa for our convenience. We'll have to find another way home. 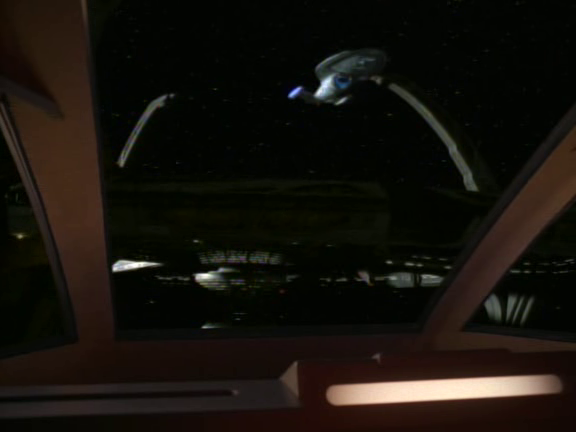 B'Elanna: What other way home is there? Who is she to be making these decisions for all of us? An Ocampa and a Talaxian - new crew members of Voyager. "It will be my job to anticipate your needs before you know you have them. And I anticipate your first need will be me." "We're alone in an uncharted part of the galaxy. We've already made some friends here, and some enemies. We have no idea of the dangers we are going to face. But one thing is clear. Both crews are going to have to work together if we're to survive. 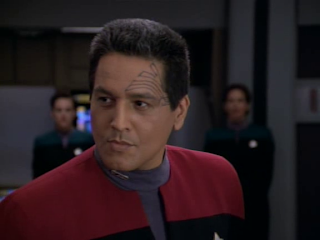 That's why Commander Chakotay and I have agreed that this should be one crew. A Starfleet crew. And as the only Starfleet crew assigned to the Delta quadrant, we'll continue to follow our directive - to seek out new worlds and explore space. But our primary goal is clear. Even at maximum speeds, it would take 75 years to reach the Federation. But I'm not willing to settle for that. There's another entity like the caretaker out there somewhere who has the ability to get us there a lot faster. We'll be looking for her. And we'll be looking for worm holes, spacial rifts, or new technologies to help us. Somewhere, along this journey, we'll find a way back. Mr Paris, set a course. For home." My favourite lines - "We are their commanding officers, we are entrusted with their safety, they are our responsibility." & "We're alone in an uncharted part of the galaxy. We've already made some friends here, and some enemies. We have no idea of the dangers we are going to face. But one thing is clear. Both crews are going to have to work together if we're to survive. That's why Commander Chakotay and I have agreed that this should be one crew. A Starfleet crew. And as the only Starfleet crew assigned to the Delta quadrant, we'll continue to follow our directive - to seek out new worlds and explore space. But our primary goal is clear. Even at maximum speeds, it would take 75 years to reach the Federation. But I'm not willing to settle for that. There's another entity like the caretaker out there somewhere who has the ability to get us there a lot faster. We'll be looking for her. 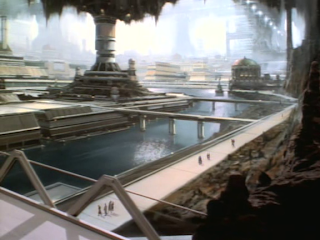 And we'll be looking for worm holes, spacial rifts, or new technologies to help us. Somewhere, along this journey, we'll find a way back. Mr Paris, set a course. For home." (8) Alicia Coppola acted in the film National Treasure: Book Of Secrets (2007) and has guest starred in television shows like NYPD Blue, Touched By An Angel, Chicago Hope, CSI: Crime Scene Investigation, Ally McBeal, Dawson's Creek, Law & Order: Criminal Intent, Monk, Las Vegas, NCIS, Medium, CSI: NY, Crossing Jordan, Bones, Jericho, Lie To Me, NCIS: Los Angeles, Revenge, and Two And A Half Men. The Eclectic Reviewer thinks... Star Trek Voyager will thrill you with exciting new aliens and countless new possibilities now that they're far away from home. And because of their unique circumstances, its a fascinating journey that has much potential for character development and growth over the years. 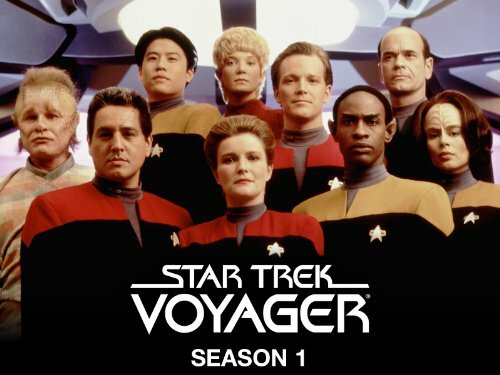 Ultimately, with "case of the week" type series like Star Trek Voyager, the longevity of the series lies much on the audiences' love for the characters. Lose that and the series dies. 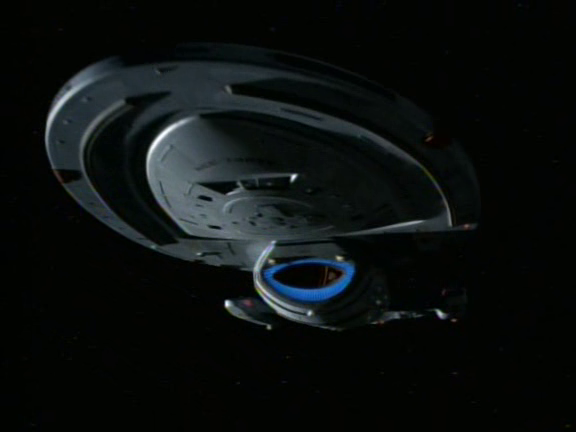 With Star Trek Voyager, I think it's off to a fantastic start.